Context: Finished this at Stephen & Abigail’s house where we first met Matthew their son. Finally read this book. Twice I’ve started it and I realised I needed to finish it before I got on the ferry to Shanghai because it’s banned in China and I didn’t want it taken off me in customs.Needn’t have worried about that really. Customs didn’t check anything boarding and only x-rayed the bag getting off.So, was it worth reading. Oh yes, I’d say so. It’s amazing, being here in China right now, to think that everyone my parents’ age walking around would have first-hand experience of the things that Chang relates in her autobiographical account of three generations of her family. It was a great insight into the recent history of China and an eye-opener for me because, despite knowing something of the political background to what she describes, I’d never heard how this all impacted the average person. 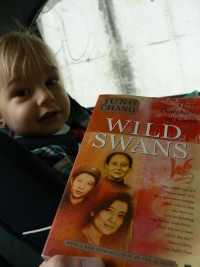 I hesitate to say “average” though because Jung Chang’s family were certainly not average. She was one of the privileged ones and her family position and connections have certainly enabled her to not only escape China but get the education that enabled her to write the book in the first place. Many others were not so privileged and their stories will never be heard this side of the grave. It’s fairly well written although this would be my biggest gripe with the book. I found it disjointed in places. While the overall book is about her family, there are tons of little anecdotes and each of these is prefaced by a hasty sketch of the political or historical background. This made the book read a little roughly in quite a few places. I also felt that her father should have been the central figure in the book because although her grandmother and mother are key figures, it’s the father’s life which really epitomises the whole era. An amazing man who lived a tragically sad life. At the age of fifteen my grandmother became the concubine of a warlord general, the police chief of a tenuous national government of China. I was eager to embrace the world. This was my best non-fiction of last year. I really loved it. This site rocks! My History teacher gave me this book as a prize at the end of high school. I agree with the review, in that it was disjointed in some places and at certain points it didnt seem to flow. It took a few attempts but I got through it in around a month. Before reading, I had little historical/political knowledge concerning China and so at times found it confusing. A small amount of research and background reading remedied this though, and I thoroughly enjoyed the stories of all three women.